I got to admit, the past few years, November was a dreadful month for me because I tend to get overwhelmed with all the upcoming events. I end up having moments of outburst because I barely could keep my own emotions in check. And guess who suffered the most from my own emotional outbreak? My kids. My family. I feel awful but I wasn’t able to get myself together for many years, every November I became a time bomb and what’s worse is that….November is the month of my Daughter’s birthday. As a SAHM and WAHM, Coffee is my survival ‘potion’ 😅 However, when it comes to November or end of the year, I need to switch up some of my go-to-drinks. So, lets start with the benefits of teas - HYDRATION, CALM ACTIVITY & ROUTINE. HYDRATION - They say any excuse to drink more liquid is a good excuse. It is obvious that our body needs to stay hydrated especially when you are stressed or overwhelmed. So find a tea (flavor) that you LOVE and enjoy and sip on it regularly. CALM ACTIVITY - Drinking tea is a calm activity because you do it slowly. The process of making a tea, letting it cool down a little and taking small sips takes your mind off things. Take that extra minute to breathe in the tea aromas, feel the warmth of your mug in your palms and be aware of how that warm tea going down from your mouth , throat….You can’t be running around with your tea so…trust me, this is calming. ROUTINE - Once you get used to tea, it can become your routine that you naturally associate it with peaceful time or me time = relaxing + calming. So here are the few mind calming teas that you can try - Peppermint Tea, Chamomile Tea, Lemon Balm Tea, Passion Flower Tea, Green Tea, and Rose Tea. *https://www.huffingtonpost.com/toby-nwazor/6-natural-tea-remedies-fo_b_10619928.html * <— click here to read how to prepare these teas. My personal favorite is Jasmine Green Tea - love the flowery scent and the good amount of caffeine but also contains polyphenol that helps combat anxiety and stress - my ultimate substitute for coffee. Calming yet not drowsy. There’s plenty of free printable planner sheets for moms on Pinterest. Just type in the search bar and you’ll get a great variety to download and use. Most of them requires your email address to opt in their mailing list but….honestly, whats the harm in putting in your email add and get your sanity back for FREE! Oh here’s the ULTIMATE thanksgiving preparation blog post that I absolutely LOVE. Make yourself a priority once in a while. It is not selfish. There is this new term called cocooning - basically means taking care of yourself, sheltering yourself. The best way for me would be doing a Face mask every week. Its my ME Time and its for me to pamper myself. I've used this mask for many years and it never fail to make my skin feels smooth after each use. I feel wonderful after it. 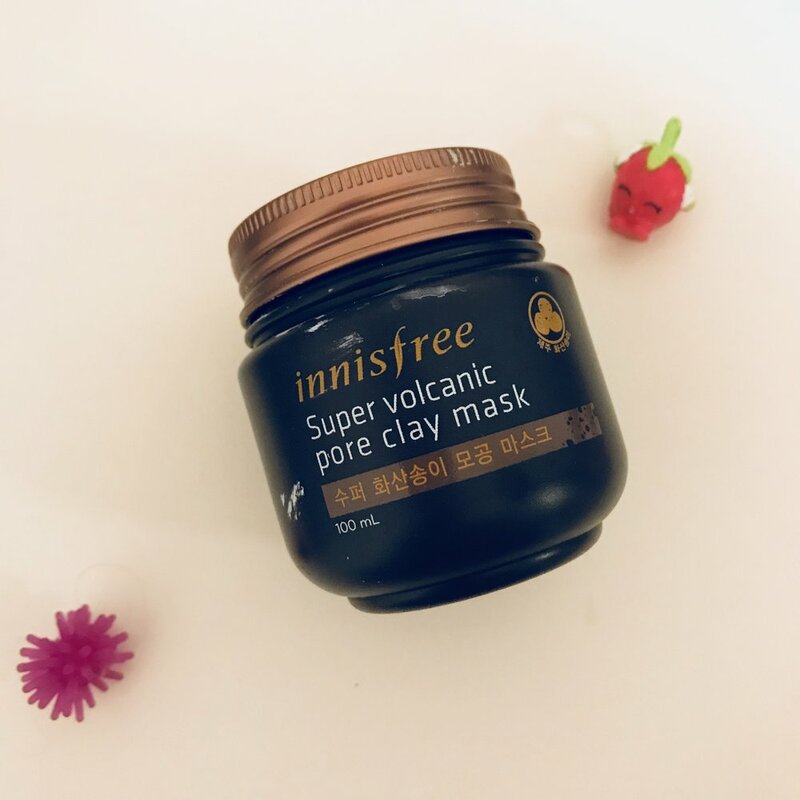 Not too sure about all its ingredients that are suppose to be beneficial for our skin but Innisfree always deliver. The only thing that I am not so fond off this product is - the application is a little challenging for me. The clay mask seems a little hard/ tough to get it out and spreading them across my face seems to require some skills as well. But other than that, its another awesome product. I've always had some spare Innisfree sheet mask with me. Love to bring them when I travel because its easy to pack and it is obviously light. They have a whole range of sheet mask and I think the price is pretty reasonable. Oh, its serum in the packet itself is quite a lot! I usually lather them over my chest and arms after each use. I'm usually dead tired everyday from running around and trying to finish every single task....So when I can finally layer this mask on me and let it dry....*while sipping my tea* it feels so relaxing....It tightens the skin and one peeled off, I can feel my skin tighten but not dried. Not irritated. Last but not least is the new HydraShield Mask that Jeunesse just launched. I have yet to get a hold of this product to try but I am SO EAGER/DESPERATE to get my hands on them! The beauty industry is changing, and Customers want high-quality products that yield long-lasting results. To meet this growing demand, Jeunesse made the Luminesce HydraShield Mask with superior biocellulose material rather than paper or hydrogel, because biocellulose masks adhere more snugly to your skin and prevent ingredients from evaporating as quickly. This also helps the HydraShield Mask seal in moisture, giving you up to 24 hours of hydration. Another leading factor in the creation of the HydraShield Mask was environmental pollution. Pollution can be a serious problem for your skin. The HydraShield Mask helps minimize the effects of daily exposure to environmental aggressors like smoke and smog, and defends against free radicals. So, those are some of my humble tips/ steps that works well to ease off some stress during the month of November. I think its pretty easy and doable, don't you think so? If you like it please subscribe, share or follow me :) Or just say Hi!